Talk to Aaron Buchanan, former frontman of Heaven’s Basement and now leader of Aaron Buchanan And The Cult Classics, and you’re reminded of the things that separate the great frontmen from the great pretenders. There’s arrogance, sure. But it’s backed by the kind of steely, unwavering confidence that only comes from knowing you can live up to your own expectations. 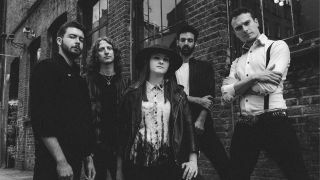 Last week the band released their debut album The Man With Stars On His Knees, Buchanan’s first album since splitting from Heaven’s Basement in October 2015. At the time he said, “The break between the band and myself is quite amicable and simple – we are going in different directions,” and both the album and new video Dancin’ Down Below prove the point. Think Soundgarden. Think Muse. Think power. And think of a band who can back up a big riff with an even bigger chorus. What was the reason for the break-up of Heaven’s Basement? The music written for The Man With Stars On His Knees had so much more depth than anything I could achieve with Heaven’s Basement. I had a vision and I had to follow it. I wanted to write heavier music, I wanted to write more theatrical music, I wanted to write music that an audience could connect to on a whole different level. The Man With Stars On His Knees defies everything we are told to be impossible in the modern age of rock as musicians. The Man With Stars On His Knees album bows to no authority. I used to come home from long tours from all across the globe, jet-lagged out of my mind and physically broken (to the eventual point where I busted an artery in my neck and needed an emergency operation to stop me from bleeding to death). Laurie [Buchanan] would be sitting in her bed-room, door cracked playing along to Coheed & Cambria, Fleetwood Mac, Andy McKee and Guthrie Govan; her favourites amongst others. The quality and execution of her playing used to fire me up and I was desperate to be on the road with somebody as obsessive compulsive as that. In my life, Laurie has played guitar so long I actually can’t ever remember a time when she hasn’t played. That’s no exaggeration! Laurie first picked up guitar when she was around five — I would have only just turned nine. Laurie, James Curtis-Thomas [producer and drummer of The Man With Stars On His Knees album], Ryan Woods and I tracked the balls of the album in two tiny rooms just outside London. I had already worked with Tom McCarthy (guitar stage right) ten years ago in another band and had already made the call with him being a part of the band. As the studio work drew to a close we found Kev Hickman (drums) on YouTube, as he had actually covered an HB track to a standard I had never seen before. I hunted him, called him, and he flew back from America after a tour supporting The Darkness and joined us. Laurie put the feelers out to Chris via social media around the same time, and that’s pretty much how it all came together. What did you want to do differently with this new project? The Cult Classics is a dangerous outfit. We haven’t gone into this writing purpose-built singles, we went into this with our balls out, making sure that before it pleased anyone else it pleased us. Why play music for the next three decades if before it’s even out of the studio it’s not something you have total belief in. That’s the biggest difference from this band to any other; what is written and produced is all about where it is placed, how it is pitched and not caring if one publication or another rants or raves about it. In todays market, musicians are focusing too much on writing basic singles utilising the same formula and not enough time honing the art of writing an album that people can listen to for ten years as opposed to ten days before the next mediocre production by a go-to producer is churned out by another label that can’t see beyond the end of its nose and signs bands on multi-album deals only to drop them three years later after the first record because they’ve realised the band is boring, isn’t selling records, and there’s no money for anyone because each song has more co-writers than strings on a double-neck guitar. What’s Dancin’ Down Below all about? Dancin’ Down Below is a sarcastic paradox to what I wrote above. I was told I couldn’t write hooks and my ideas were not good enough to be taken further than the demo-zone, so I sarcastically threw a song together where the hook is before the first verse, immediately before the chorus, immediately after the chorus, immediately before the middle eight, straight after the middle eight, and the last thing you hear before the song finishes. I didn’t do it for me, I did it to prove a point. The actually lyrical content is based on imagining life through the eyes of Iggy Pop - if you want to talk “rockstar qualities”, he’s a guy I look up to - Henry Rollins’ skit on his time playing shows with The Stooges brings me to tears in laughter every time I watch it - Iggy Pop is the difference between a legend and a leg-end, which for the most part, is all we are left with. I don’t want to continue the path of being inspired by anything less than a man who has survived the way Iggy Pop has - how is he still alive?! What part did your upbringing in Essex play in shaping the musician you are? I moved away. I got to 18 years old. My parents went on holiday for a week and when they came back I had left home. My parents are great — I couldn’t have achieved anything I have today without them — but Essex is about as inspiring as alcohol-free beer. I moved to the country, bought a boat, started touring the world with my previous band and from that, through those experiences, (and traumas for want of a better expression) The Man With Stars On His Knees was born. What can fans expect from your upcoming live dates? The Cult Classics are smartly dressed but not at all tame. Camden Rocks, Download Festival, Wildfire Festival and Ramblin Man Fair all have an audience that we have grown up with so it’s important to each of us in The Cult Classics to give them the show we wanted to see when we were the kids buying tickets back in the day. I seem to have built up a reputation without realising during my time in Heaven’s Basement for being unique as a frontman. I don’t know how or why - all I do is what I believe every other frontman should do; engage your audience and meet them after your shows. The least you can do when you’re lucky enough to be able to do music as your job (which in its self is a luxury) is meet the people that bought the tickets to see you. I love music, I love people, it’s our job to give them the experience we craved at shows when we were the kids buying the tickets. Are you rock’s next big thing? Is Classic Rock going to put us on the front cover? What rock frontmen and women do you admire, and why? From Lyndsey Buckingham and Stevie Nicks (not forgetting the phenomenal Christine McVie) right through to Annie Lennox, Lana Del Rey and Freddie Mercury. From Chris Cornell (appalling news of his death, a huge influence on the new record may I add, and the saddest news on a personal level to me since the passing of the now late David Bowie) to Layne Stayley, Scott Weiland and Eddie Vedder - all these front-women and men had performance qualities beyond those of their peers. There’s a reason we still crave listening to their music and why they have become staples of the industry. Each and every one of them will go down in legend for their unique, innovative timbre and style. It would be wrong of me to pin-point any individual as the soul influence of the music The Cult Classics produces because to be unique, a dash of many influences and styles is what it takes to create something of an ilk that strives to one day be placed in a similar realm. The Cult Classics are fans of music, it doesn’t matter what style of music, it doesn’t matter what era. The best band I saw at Reading Festival in 2015 was Years & Years, and this is coming from a guy whose first ever gig was the Unholy Alliance tour with Slipknot, Slayer, Hatebreed and Mastodon. All I care about, and all I want the people I work with to care about, is “Are we proud of this?”. The Man With Stars On His Knees is out now.